The morning was very cold with a thick layer of frost covering the tents, so we didn’t waste time packing up and getting on our way. 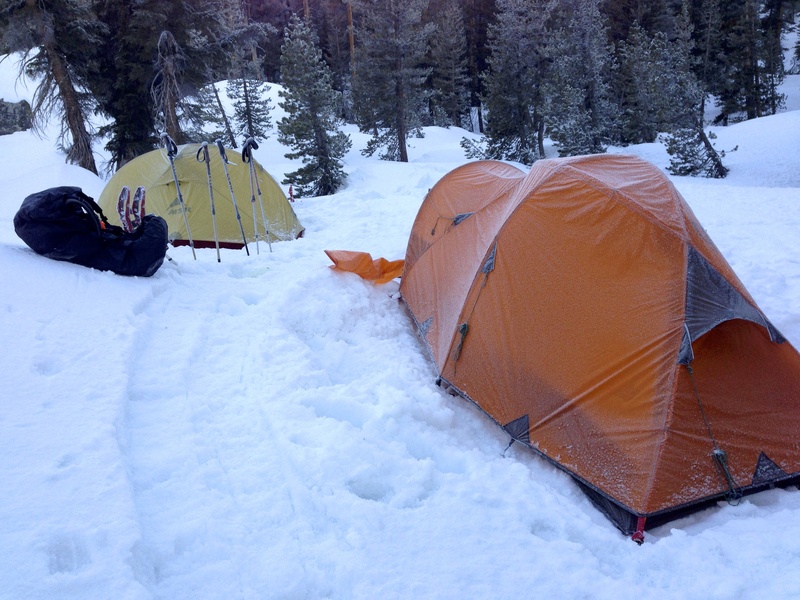 Once we got out of the small valley we camped in the temperature warmed up significantly. The sun was out and a few clouds floated overhead. 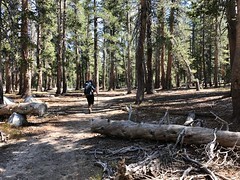 The four miles between camp and Tenaya Lake were mostly down hill and went by quickly. We arrived at Tenaya about noon. The lake was frozen over with a layer of blue ice. We could see ski tracks crisscrossing the surface. 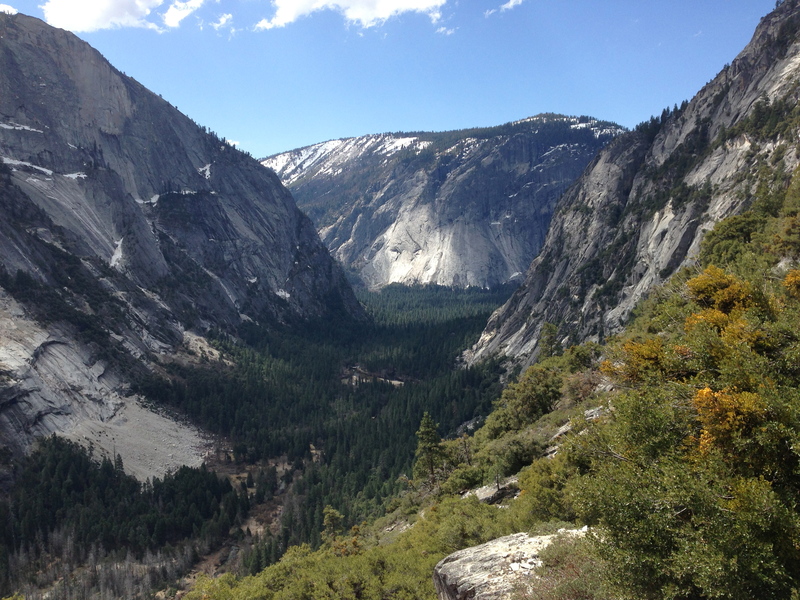 From Tenaya we were going to follow Tioga Pass towards Snow Creek cabin. 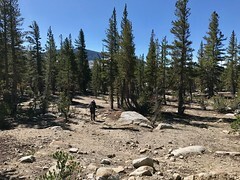 Before we could continue down the road, we first had to cross the wide outlet of Tenaya Lake and there was no bridge… We found a section that was fairly shallow and would let us cross to a snow free patch of river bank. Stepping out of the boots onto the cold snow was accompanied by a few yelps of shock. The snow bank held us about a foot and a half above the water and the first step down was taken with visions of the snow breaking away under foot flashing through my head. The water felt surprisingly warm compared to the snow moments before, but after a few steps the cold crept in and my toes began to tingle, each step getting a little shakier as the cold water numbed my feet. Back on the dry river bank we stopped for lunch and let our feet dry and warm up in the sun. The air temperature was quite pleasant. 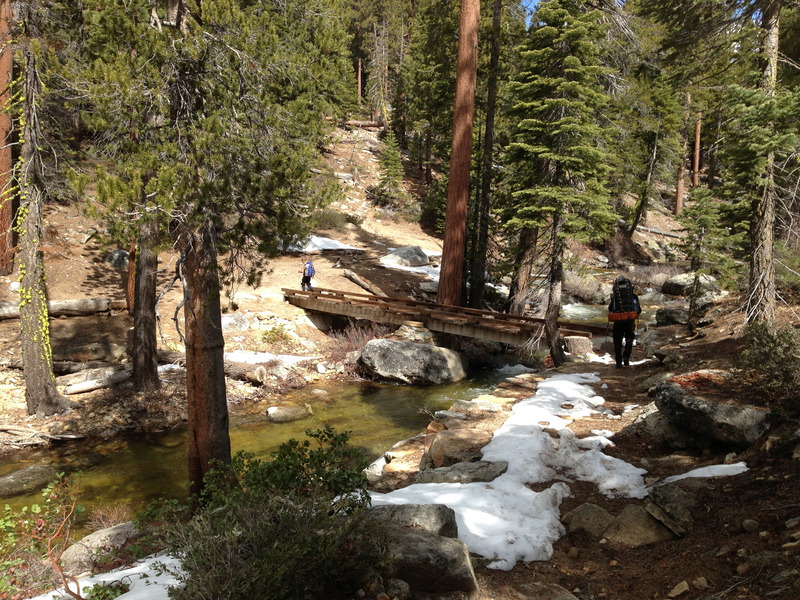 After lunch we started our way down Tioga Pass towards the Tuolumne Meadows Trail. We were getting the full force of the afternoon sun as we made our way down the road. The sun had made the snow quite soft which made for slow going with the snow shoes. Hiking was hot and slow, but offered some spectacular views of Clouds Rest. 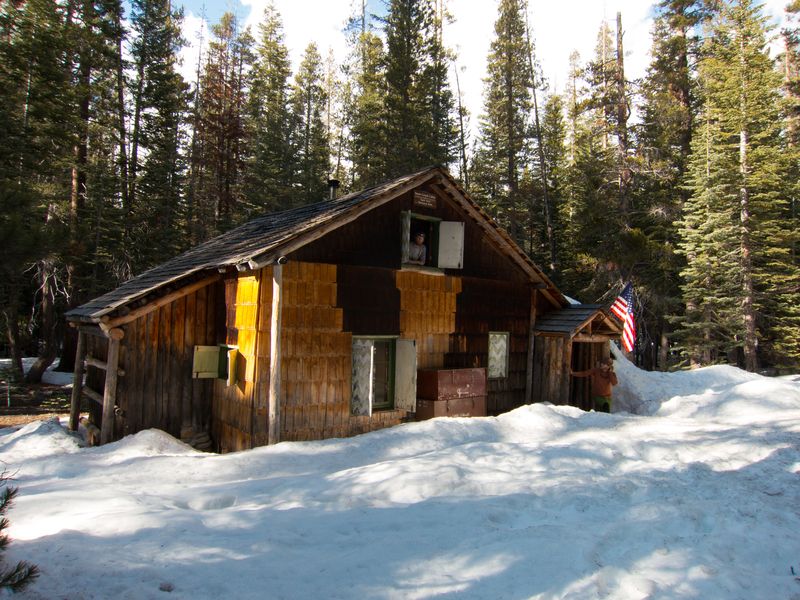 Once we reached Tuolumne Meadows Trail, we left the road and started descending towards Snow Creek Cabin. 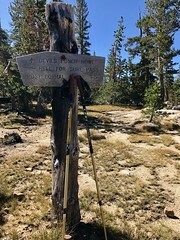 The trail was marked by license plates attached to trees high above snow line. 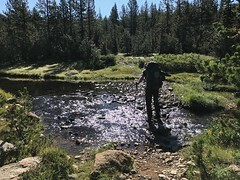 We lost the trail markers as we descended from the ridge where we found the stream that the cabin was supposed to be by. The exact location of the cabin is not clearly marked on maps and does not appear on the Tom Harrison map that I had. So we were following GPS coordinates that we found online along with a vague description of the location of the cabin. 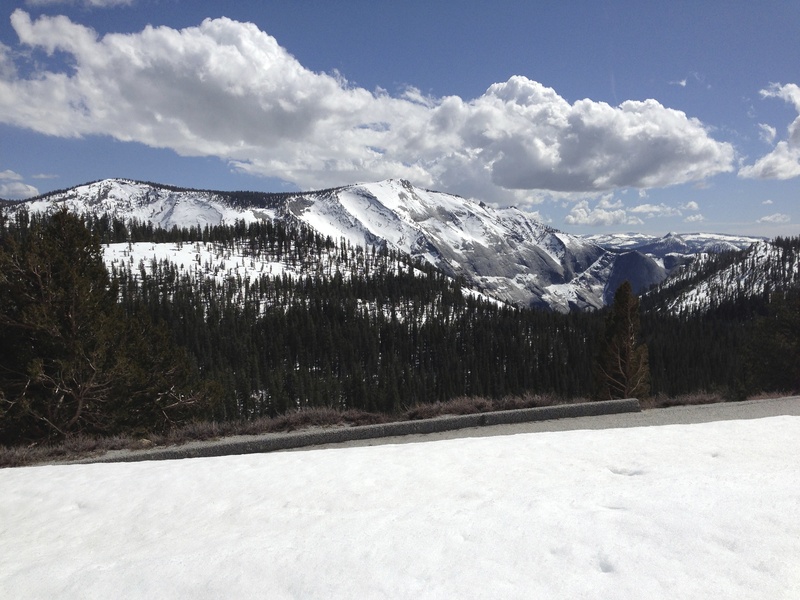 We found the intersection of the Tenaya Lake and Tuolumne Meadows trails. 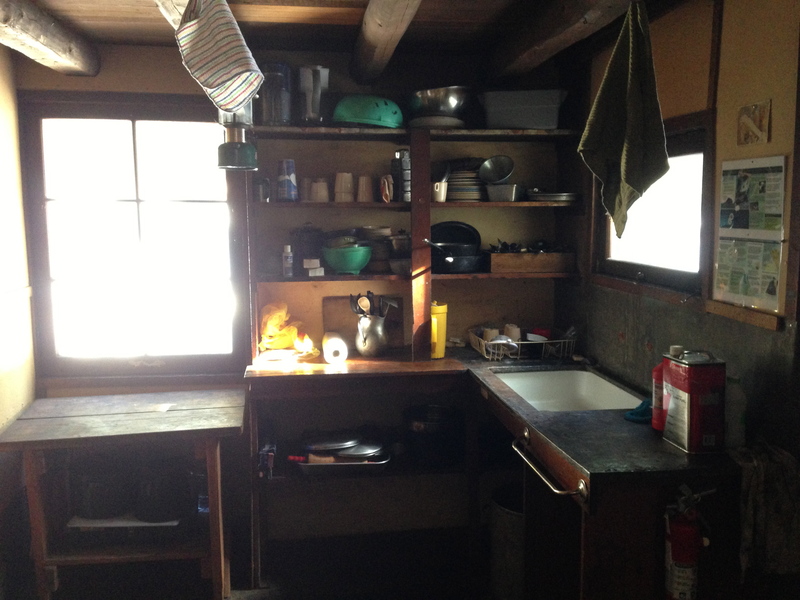 From there is was a matter of fanning out and playing a game of hide-and-seek with a cabin. We wondered the woods for 15 to 20 minutes before I spotted the cabin peaking out between the trees! The cabin was far greater than any of us imagined! 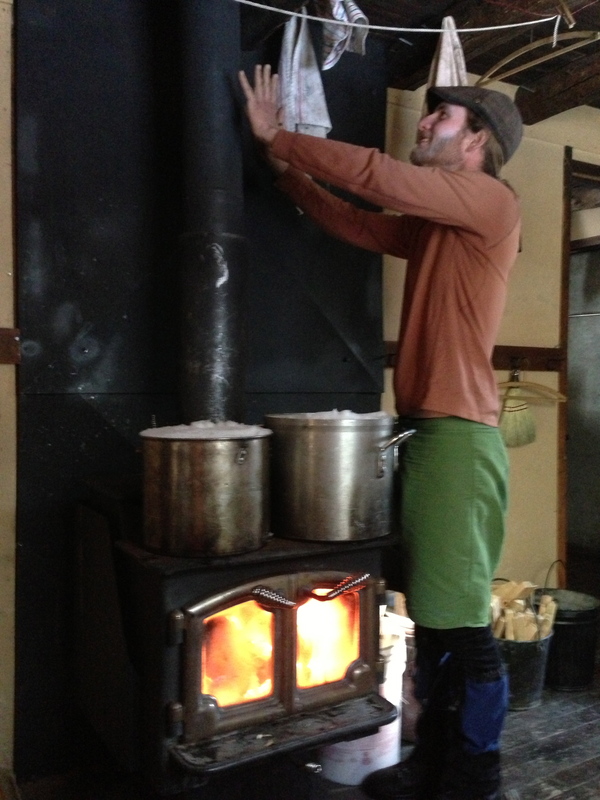 It was two floors complete with a wood stove in the living area, a kitchen (no plumbing or electricity, but it did have a propane stove! ), three bedrooms, outhouse, and an ample supply of dry wood! There were cards, board games, books, dishes, and even a guitar! 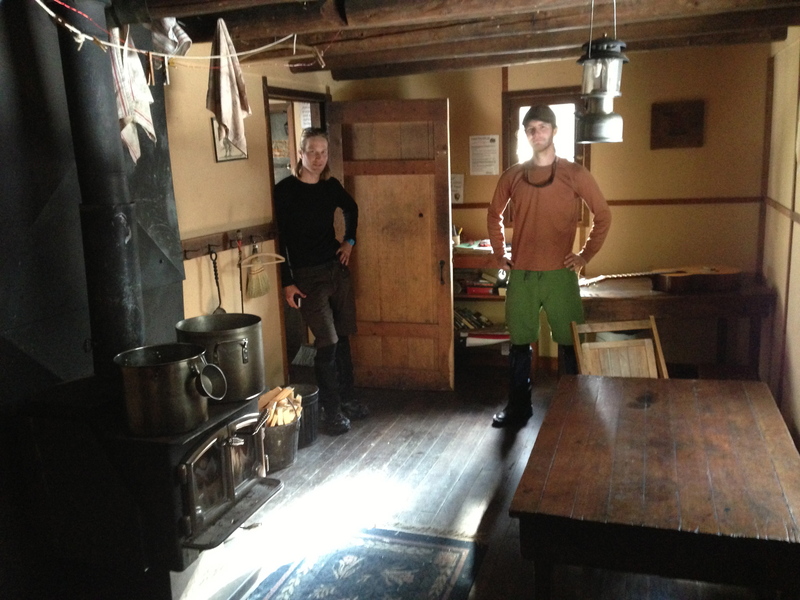 We were the only ones there, so we got a fire going and enjoyed a warm evening in a backcountry cabin. The next morning we closed up the cabin and started our way down Snow Creek Trail to the valley floor. This trail descended gradually for a couple of miles before we started down the 108 switchbacks to the valley floor. The descent was steep and offered great views of the valley below, but I was very glad we didn’t climb this route our first day out. It wasn’t long before we were back at the car and on the road back to the Bay Area. 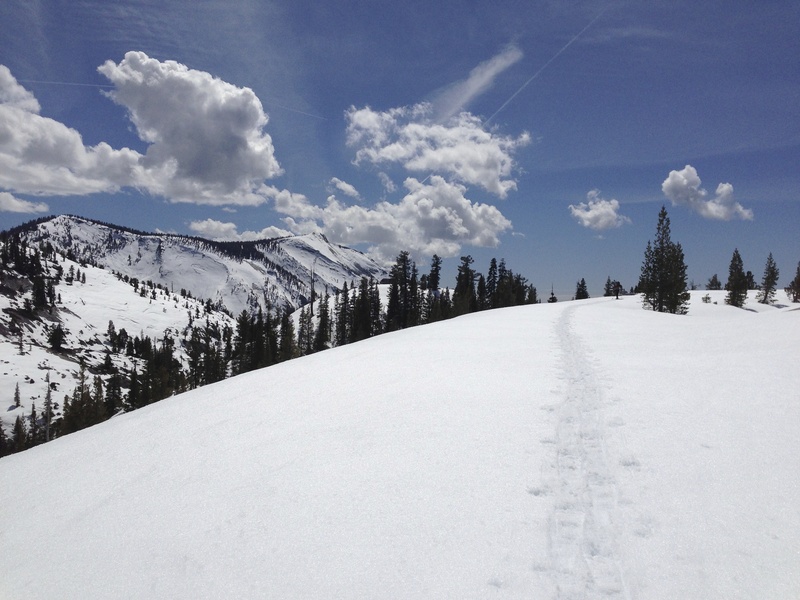 The end of amazing trips is always sad, but it was a great feeling to have conquered Clouds Rest in the snow! Don’t miss out on the first half of this trip! For more photos check out the album on Flickr!